Acclaimed chairman of Marvel Comics has died at 95. Marvel fans look back on his legacy and contributions to the genre. Renowned graphic artist Stan Lee –– a “superhero” in his craft –– died at 95 years old. Lee died in the hospital on Monday after becoming ill, as first reported by TMZ. Lee founded the world famous Marvel Comics alongside Jack Kirby in 1961. He went on to create popular characters such as Spider-Man, Black Panther, The Hulk, Thor and Iron Man. Comic book and film fans quickly took to social media to express their grief and speak about his legacy. Many UB community members are also hurt by the loss of a treasure to the comic community. Jeremy Kazimer, a junior physics major and president of the UB Comics Club, said Lee was an icon and a titan of his time. “Not only had he pioneered the success and longevity of Marvel, but his contributions to the comic industry are strikingly apparent,” Kazimer said. Lee helped produce the Marvel Cinematic Universe film canon and made cameos in nearly of the canon’s movies. In 2009, Disney announced a deal to acquire Marvel Entertainment for $4.28 billion, and Marvel’s films have grossed over $12.2 billion in total, an average of roughly $231 million per film, according to boxofficemojo.com. Lee is also considered one of the most significant figures within the comic book community, with his work on some of the most successful film franchises of all time. “Having spent two weeks researching with his papers for my dissertation made him seem all the more present to me, so that the timing of his death felt sudden, his age and health not withstanding,” Deverell wrote. Eric Pritchard, an English professor and avid comic fan, spoke about Lee’s significance to his own life. “Stan Lee's presence will be felt every time someone opens the pages of a Marvel comic book forever,” Pritchard said. Samantha Vargas is the asst. 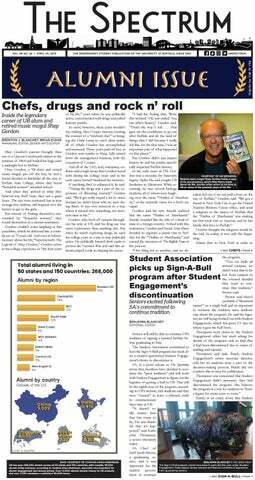 arts editor and can be reached at Samantha.Vargas@ubspectrum.com.